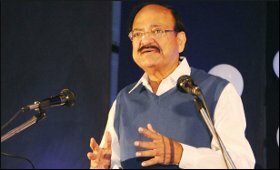 Vice President M. Venkaiah Naidu will go on a week-long tour of Serbia, Malta and Romania from September 14, an official announced on Thursday. He will be accompanied by Union Minister of State for Finance Shiv Pratap Shukla, Rajya Sabha Members Prasanna Acharya, Vijila Satyanand and Saroj Pandey, Lok Sabha Member Raghav Lakhanpal and a business delegation spearheaded by industry body CII. Briefing the media here, Anju Kumar, Joint Secretary (Central Europe) in the External Affairs Ministry, said that the visit is being undertaken given the importance of the geo-strategic location of all the three countries. Malta and Romania are members of the European Union (EU) and facilitate India's access to the European market. While Serbia's annual growth rate is over 3 per cent, the growth rates of both Malta and Romania are over 5 per cent. "India has strong traditional and historical linkages with all the three countries," Kumar said. Giving details, Kumar said that the Vice President will reach Serbia on September 14 afternoon and address members of the Indian community there, numbering less than 100. The next day, he will hold meetings with the Serbian President, Prime Minister and the Speaker of the National Assembly and address a Parliament session. This will be the first high-level visit from India to Serbia since that country became an independent republic in 2006 following the breakup of Yugoslavia. Serbia gives visa-free access to Indians and India-Serbia bilateral trade stands at around $200 million. After Serbia, Naidu will visit Malta from September 16 to 18. He will hold meetings with the Maltese President, Prime Minister and Speaker of the House of Representatives, besides addressing members of the Indian community there that is only 700-strong. The Vice President will also attend a business event. The Mediterranean Sea archipelago nation is considered a transhipment hub as it is at the crossroads of North Africa and Europe. Though India established diplomatic ties with Malta in 1965, it established a permanent High Commission only last year. Malta extended cooperation to India's evacuation operation from war-torn Libya in 2011 and again in 2014. India-Malta bilateral trade stands at around $210 million and Indian IT companies have good opportunities there, according to Kumar. An Indian pharmaceutical company has also established a large presence in that country. From Malta, Naidu will visit Romania from September 18 to 20 on the the third and last leg of his tour, coinciding with the 70th anniversary of diplomatic ties between the two and the centenary year of that country's formation. The Vice President will hold meetings with the Romanian President, Prime Minister and President of the Senate and address the Chamber of Deputies, the lower house of Parliament. He will also participate in a business event and address members of the small Indian community there that numbers around 200. India has bilateral trade worth around $810 million with Romania, which is rich in natural resources like bauxite, aluminum, oil and gas. "Several Indian companies have invested in Romania and vice versa," Kumar said. She added that there will be deliverables in areas like agriculture and tourism among others in all the three countries.